A few months ago I received an email asking me to enter a recipe contest utilizing matcha. 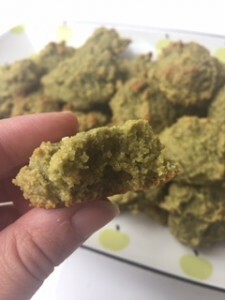 I ended up making some super amazing matcha almond cookies, but before I get to that, I have a few things I would like to say about matcha. For those of you that don’t know what matcha is, it is basically ground up green tea leaves and looks like a green powder. Instead of steeping it in water like with traditional tea, it is mixed into the water and consumed. Because it is actually consumed, some people claim there are even more health benefits of matcha versus traditional green tea. For those of you that do know about matcha, you have probably heard a lot of buzz about all the health benefits. It seems to be mostly touted as good for your brain and mood, but I have also seen fat burning and metabolism boosting claims. Prior to this contest, I have never used matcha before and wanted to do some research to see if it lived up to all the hype. Of note…if you don’t know me very well I am a skeptic at heart and like to investigate things myself before I actually believe pretty much anything or trust things, people, etc. It does make me a very good dietitian but sometimes can be a drawback in the social scene or networking for my business. For example… “Why is this person talking to me? What do they want?” is a thought that often goes through my brain. Anyways…when searching for actual research studies involving matcha, I really did not find that many, and quite a few of them that came up had nothing to do with matcha, but had an author with the last name of Matcha. Super helpful. What I did find however, was that some of the components of matcha have been researched, so a lot of the health claims don’t necessarily involve matcha itself, but those specific compounds in the matcha. While I prefer research with whole foods versus specific components or nutrients, (because we don’t eat nutrients, we eat food) there is really not much available. So let me tell you about some of the research involving a couple of the individual components that are in matcha, because honestly that is all I have. These two component appear to work synergistically. Adding the L-theanine to the caffeine helps prevent the jitteriness of caffeine due to its relaxation effect, so it is a different type of “high” versus what you would get from drinking coffee. Additionally, we know the traditional way of consuming green tea is good for you. Research has shown it can reduce the risk of certain types of cancer, improve heart health and may even help you to live longer, among a host of many other possible health benefits. Green tea is loaded with lots of powerful compounds and antioxidants, so that’s great too. We can guess that at least some of these benefits of consuming traditional green tea will likely also be present when consuming matcha but we really can’t say for certain or to what extent. Also, more is not always better, even if it is more of a good thing, so just dumping a whole bunch of matcha in your smoothie probably isn’t the best idea. Whether or not matcha is better than traditional green tea is a question that remains to be answered. If you enjoy matcha, go ahead and continue to enjoy it, and if you want to try it, go ahead. But don’t set your expectations too high and believe everything the package claims. So bottomline – adding matcha to recipes will add some caffeine, and a boost of antioxidants, but to say that its health benefits are greater than traditional green tea or to give specific health claims is unfounded at this point in time. Despite the lack of research I did go ahead and try my hand at including matcha in a recipe with minimal expectations as how it would effect my health. Because maybe in a year or two we will have some more research and proven health benefits. (There were a few promising animal studies I stumbled upon…so maybe the people studies are coming soon?) 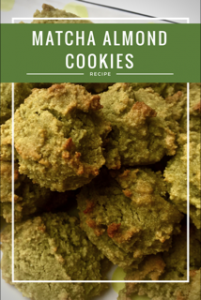 So let me get to the matcha almond cookies…. 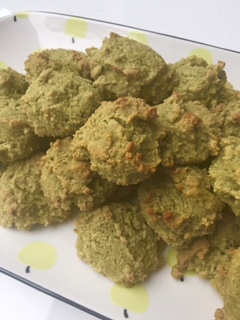 I ended up taking one of my favorite almond cookie recipes (It is from David Lebovitz’s blog and you can find it here) and modifying it to include matcha and decrease the amount of sugar and calories to make it a little more nutritious (well as nutritious as a delicious cookies can be). 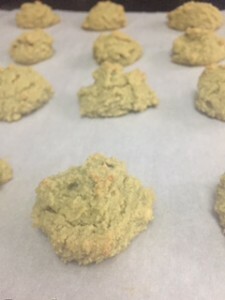 And my matcha almond cookies were born! Adding the matcha definitely added a different layer of flavor and I loved it. It went really well with the almonds and the agave. I may continue to experiment with the matcha to add some flavor depth and additional antioxidants to recipes, but I don’t expect my life or health to change significantly because of it. Preheat oven to 300 degrees and line baking sheets with parchment paper. Add egg whites and salt to a large mixing bowl. Use a hand mixer to beat egg mixture on low until peaks form. Combine agave with beaten egg whites, then add almond extract and stir well. Add in flour, baking powder and matcha and mix until uniform. 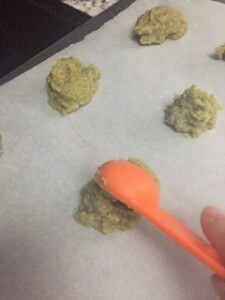 Scoop batter by heaping teaspoons onto parchment lined baking sheet. Bake cookies for 15-17 minutes or until browned on edges. Remove from oven and allow to cool. Makes approximately 40 cookies.